Tancredo has decided not to run for a sixth Congressional term. WASHINGTON (CNN) - Rep. Tom Tancredo plans to retire from the House at the end of his term but will continue with his bid for the GOP presidential nomination, his office said Monday. The story was first reported by the Rocky Mountain News, which said the 61-year-old Coloradan informed his staff Sunday night in a letter in which he said he feels he has accomplished what he had hoped to accomplish by raising immigration as an issue. He added that he wants to spend time with his five grandchildren. Tancredo, who was elected to Congress in 1998, was campaigning Monday in Iowa. 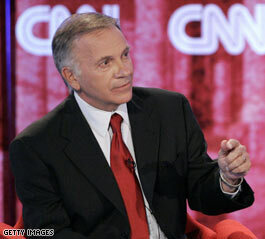 Tom Tancredo is a real Patriot of this country and he is a long-shot for president vacancy right now. I hope it will be changed very soon and more Americans will understand that he is for saving American culture and language, otherwise in 10 years we all will be minority in the country poorer than Mexico. People, please, give him a chance, listen to him and you will be taken by his common sense and sincerity. Vote for Tancredo! Tommy is going to get the time he wishes. For his grandchildren. That's a good thing. Iraq war? Terrorism? Our failing economy? Any of that ring a bell? Seriously, if you can't focus on anything else besides illegal immigration, then you're not fit to be president. Colorado was the first non border state to be impacted by illegal immigration. Frustrated that the Federal Government was doing nothing to control it is what brought Tom to Washington in 1998 He wins elections in the 6th district by wide margins and even Karl Rove could not find anyone to run against Tom in 2004. His issue is not racist, and he is the only candidate with controlling illegal immigration, securing our borders and protecting the sovereignty of this Republic front and center of his campaign. Those of you who choose to criticize Tanc, better take a look at the other candidates and their association with the Council on Foreign Relations; and the agenda of the Council on Foreign Relations before you go to the polls. My money, my time and my energy are going to Tom Tancredo for POTUS. Yes he can beat Hillary because if any of those CFR pukes get the nomination many informed Americans will stay home in November '08. Too bad we can't get rid of the rest of the Republican scumbags this easy. Tom Tancredo is preparing to fade into the obscurity he so richly deserves. While I won't miss being represented by this huge embarrassing failure, I shudder to think about the next huge embarrassing failure the GOP birdbrains around here will come up with to replace him. I'd like to see a Democrat elected around here, but I won't hold my breath. I used to feel the same way when I lived in Pueblo, Chris, and the people of the 3rd CD kept re-electing Scott McPinhead. But then he decided to retire and we got a REAL congressman for a change – John Salazar. And when Ben Nightmare Campbell decided to retire, we got a real Senator – John's brother Ken. And when Wayne Dullard retires next year, chances look very good that your next Senator will be Mark Udall. There's hope for your district yet, Chris. Hang in there – and help turn Colorado more blue!!!! Great you have a diverse relationship, so do I, guess what I still am against illegal immigration, and Im not a xenophobe, im just for not letting people run amuck here illegally. this country has a right to know who you are and were you are espesially if you want all the great benefits this country has to offer. I cant wait for the day when people realize that mexico is the one with the problem, why is it that so many people come here from mexico. how come the same amount of canadians arent flooding down here, if they are kick them out too. Does that make me xenophobic or is it ok to not like illegal canadians or canadians for that matter, because they are mostly white. He is not worthy of running for any position. He forgot his heritage and how he came over into this country. I will vote against him in any way I can. We need better men for the GOP presidential nomination. Tancredo is flawed in may ways. Tom Tancredo is not a racist – but he is a STRAIGHT SHOOTER! He is very much against ILLEGAL IMMIGRATION as every legal American should be. Say what you will, Tom is a good man, and has brought it to the attention of the American voters. He is to be commended for his stand. If America doesn't wake up, we are doomed! hey dave, no my friend we are not criminal scumbags. we are people that were forced to leave our country thanks to the politics of this country towards latin america(third world countries).any ways you like tomcredo what do you know?i'm glad tomcredo is stepping down that means we will not be torture any more by listenning to him talk. Colorado is losing a really great Representative who has voted for the right things and introduced bills that truly represent the people. Hopefully this will only mean that our Nation will gain the benefit of this man who so accurately and conscientiously represents us to be our next President!! Sounds like we have a few uneducated, ignorant readers leaving comments containing a great deal of name-calling, but absolutely NO content. I love it when readers use their freedom of speech to draw attention to their ineptitude. For those of you who haven't noticed: OUR COUNTRY IS IN A CRISIS! We are on the edge of losing every constitutional freedom we have inherited – and we're in this mess because special interest groups and greedy corporations control our President and most of our politicians. American citizens no longer have a voice! We're on the edge of losing any voting power that we still have. Look at the amnesty issue that we've had to defeat FIVE times! Look at the border(less) fence that should have been built by now and isn't! Tom Tancredo is the only candidate who has the courage to attempt to put power back in the hands of hard-working American citizens – where it belongs! I suggest those who resort to name-calling and meaningless posts should perhaps run for politicial office and see how far you get. Tom Tancredo is the only candidate running for President that has the true interest of the American people at heart. He is says it like it is. He is probably the most honest of all the candiates running. He is the last best hope for theis once Great Country. Unless of course we want to end up like Europe. I'm a Democrat and totally against illegal immigration. I think our borders need to be secured and that the illegal immigrants here should be treated as criminals – thats what they are. Employers who hire them and those who house them need to subject to stiff penalties. Because I oppose illegal immigration does that mean I dispise hispanics? I dont think so. I am hispanic! Okay, I can understand retiring from the House to concentrate on running for the White House. To give a lame excuse to spend more time with his grandchildren is almost to be a lie. Should he run and win the White House, how much time would he have to spend with his grandchildren? I would think a whole lot less unless he follows G. W. Bush's example of how much time to take off. He is spending his time campaging and being a member of the U.S. House, how much time is he doing anything and how well is it being done? Just a few things to think about. You aren't "scumbags" but if you are an illegal immigrant than you are a criminal. Don't you find it odd that over 50,000 illegals can get together and demand rights in America and yet they can do nothing in their own country? What makes a person think its ok to sneak into a country, use false documents and steal identity? What makes a person think they are deserving of services provided by a system they never contributed to? I have to seriously question the morals of people who are esentially teaching their children that it is ok to steal, lie and break the laws because they are "victims". Are you aware that the Mexican government deports more illegal aliens than the US? You should go read the Mexican Constitution under the Ley General de Poblacion, and read Mexico's own immigration laws. Mexican law makes it a felony to be an illegal alien in Mexico. Why then is it such an atrocity for the US to exercise these same rights? Have you seen the state of our public schools and how overcrowded they are? Have you seen the local emergency rooms be forced to close their doors? A country has every right to limit the number of people coming in and to know both the identity and possible criminal history of potential citizens. A country has the right to deny access to our borders. Period. I find it comical and sad at the same time reading some of these posts. It just shows how uneducated some of you are. Bradley Schaubs, if you didn't realize the core of a lot of America's problems stem from illegal immigrants. Such as healthcare, education and our falling economy. I also believe Tom has ideas that will help us succeed in the Iraq War. Why don't you read up about the truths of illegal immigration and Tom Tancredo before you criticize. Hon. Tom Tancredo – We have been looking at CCN, the controversy of the "legal and ilegal" inmigrants. In my opinion, no one had read the "Treaty of Limits with Canada"
Tom got into this campaign to push the issue of illegal immigration and unsecure borders up front. It has nothing to do with ethnicity, but facts are facts and the majority of illegal aliens here are from south of the border, and their government pushes them into our country to earn money to send back there. This after so many of our industries closed and moved down there. Wages are depressed for our citizens, high school kids have difficulty getting part time and summer jobs, our schools are over crowded, crime has increased, our jails and prisons are filled to the max, hospital emergency rooms, even whole hospitals have had to close because the illegals don't pay their bills. People's lives have been ruined because of identity theft. All we want is for the laws to be enforced. That is all Tom Tancredo is promising to do. Enforce the laws for the American People. The American People need to get behind him more. If 87% of the American People really want something done about this problem that has been ignored and allowed to fester for 21 years, Tom Tancredo is your man. No other candidate is making this promise; no other candidate has the track record he has on this issue. He has done all he can do as a congressman, all of his efforts die in the Senate. He is my pick of the litter for POTUS and my constant prayer is he will succeed. America will succeed when he does.